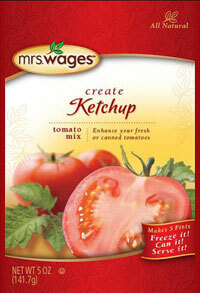 Mrs. Wages Create Ketchup Tomato Mix contains just the right spices with fresh or canned tomatoes, or tomato juice, for a mouth-watering ketchup that will surely delight your family! Makes 5 pints. Ready to eat in 24 hours after preparation. 5oz. Salt, Food Starch, Sugar, Paprika, Dehydrated Onion, Natural Flavor, Xanthan Gum, Citric Acid, Soybean Oil, Spice, Dehydrated Garlic.